Father Richard McGuire, OCSO, who has been chaplain in Esmeraldas for the last twenty-five years, returned to Mepkin at the end of November. 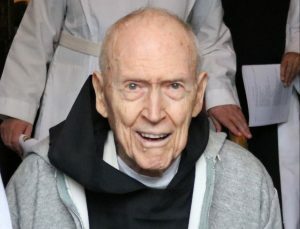 Father Richard, a sprightly 92-year-old, has given enormous assistance to the sisters there. They were deeply sorry to see him go. He returns to Mepkin, a place where he lived for an extended period of time, and where he acted as Prior for twenty-one years. The monks are very glad to have his kind, gentle, and gracious presence among them. We wish Father Richard many happy years upon his return to his home, Mepkin Abbey.